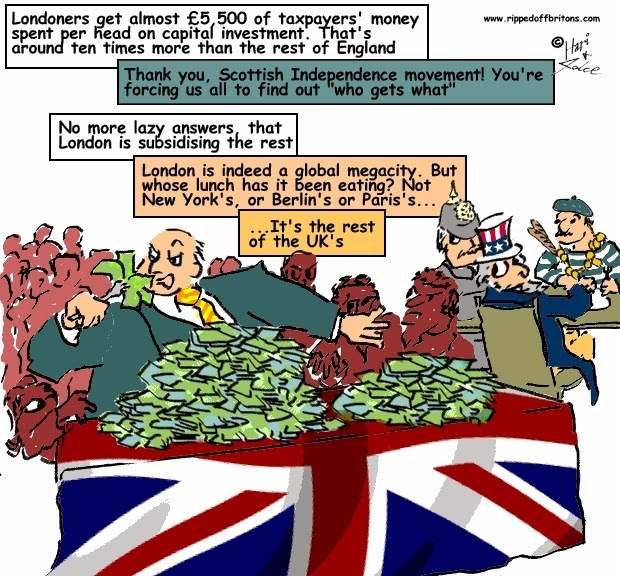 Figures derived from a research report by IPPR, show Londoners receive around ten times more per head spent on capital investment than the rest of England – a discrepancy sure to reignite a long-running row on whether London’s growth is coming at the detriment of the rest of the UK. In August the UK chancellor George Osborne endorsed a £15bn plan to improve infrastructure in five northern cities this week. Although he did not commit to any funding, Osborne said the overall aim was: “To end the imbalance in the UK economy so our success is not wholly dependent on the global city of London, so we have across the north of England individual cities that are better connected, have a better quality of life, and are able to create.” Comparing London and the North, London’s Crossrail alone is earmarked to receive nine times more funding than all the rail projects from the North’s three regions combined. Other projects in the capital including tube improvements mean that £5,426 will have been spent on each resident of London compared to £223 on those in the north-east region (i.e. over 24 times as much). The prime minister has welcomed an ambitious proposal to devolve power to UK city regions along the same brisk timetable as the Scottish devolution process, suggesting Greater Manchester and West Yorkshire could gain more autonomy in 2015. The report from the City Growth Commission argues that devolution from Whitehall to city regions will boost economic output in the UK’s 15 largest metropolitan areas (“metros”) by £79bn per year – approaching 5% of current GDP. It also proposes a vastly improved transport network in the north of England across the Pennines, including a northern answer to London’s Oyster card – dubbed the “Noyster”. Praising the report as “absolutely first class”, David Cameron told Prime Minister’s Questions on Wednesday that there was a “real opportunity” to rebalance the economy using high speed rail and other infrastructure to “link up our great northern cities” and create a “northern powerhouse”. The report was welcomed by business people and political leaders in the 15 “metros” singled out in the report: London, Greater Manchester, West Midlands, West Yorkshire, Glasgow, Merseyside, Tyne and Wear, South Yorkshire, East Midlands, South Hampshire, Edinburgh, Cardiff, Bristol, Belfast and Leicester. But smaller cities, like Hull, Peterborough and Carlisle, expressed concern that they will be left out.